Our script is most suited for educational institutions and corporate companies as it is one of the easy and a more probable solution for the recruiters. It enables the recruiters to set the questions for aptitude and technical based quiz. The results will be declared right after the exam and the candidates can be selected or shortlisted based on that. We have developed this script with 3 different logins namely; admin, parent and student logins. The students can login and take up a quiz or an exam based on the category they choose. We offer several categories and sub categories. The biggest advantage of our script is that it has numerous categories and sub-categories so the there is vast knowledge and lots of things to be learnt from while developing their communication skills by interacting with new students and teachers. The parent login enables you to add more students, keep track of their children’s exam and course details, attendance details and the exam schedule. They can also see the notifications sent by the admin. Through the admin login, you can set the quiz questions, the category and sub-category it belongs to, publishing the result, you can create quiz or exam questions in multiple languages. The admin can send and receive messages from the students and the parents. The admin panel also has the option of reviewing the feedback from the students and the parents. 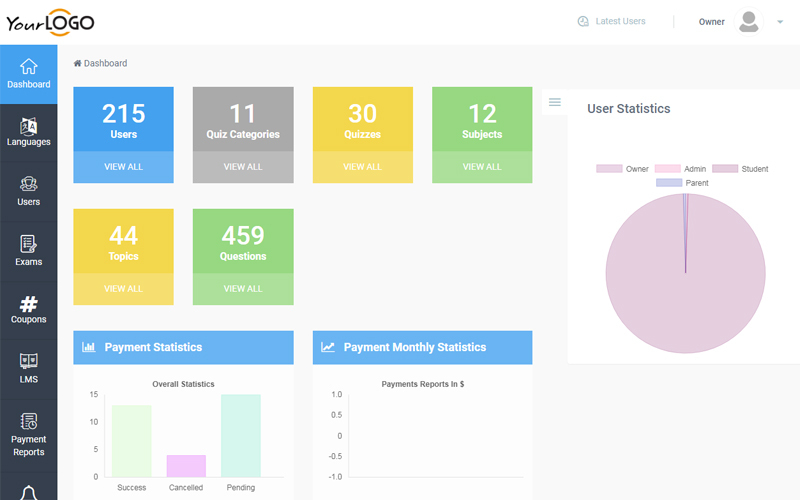 The admin dashboard displays the payment status and the number of paid quiz taken. SEO-Friendly design ensures that you site is always visible and comes on top of the search results as it is optimized in accordance with Google standards. Multiple Category management is available to enlist default categories for easy search and navigation. They need to provide their name, phone number, date of birth. They can re-set the password using registered mail-Id by clicking the “Forgot Password” in the bottom of the page. This script is the combination of excellent business model and pay per exam feature which makes you start experiencing success within a short duration. We provide you with 1 year of technical Support and 6 months of free updates for the source code. Upon purchase of the script, we will give you the full source code is absolutely brand-free. If you still have any queries, feel free to contact us. We would be glad to help you out. Last week I bought this script to start my e-Learning services. Outstanding script development as much category I can add. On time support from your side makes me comfort. I just love this script really it’s a user friendly script design to take class and Conduct exams. Just a one what I wish. Thank You.